"Everlasting peace be upon you ❤️😇🔥"
Elliston, Sherry passed away peacefully at Campbell House Hospice on Friday October 19, 2018 surrounded with the love of her family. Loving wife of Gordon of Wasaga Beach. Proud mother of Jeffery Elliston and step mother of Katrina and Michael Elliston. A wonderful grandma to Katrina’s children Matthew and Marisa. Dearest daughter of Joan and her late father David Janes. Sherry will be deeply missed by her sisters Beth Majoran (Steven), Connie Lima (Peter) and her brothers Bill and Paul Janes (Stephanie). Visitation will be held at Fawcett Funeral Home – Collingwood Chapel on Monday October 22, 2018 from 2 p.m. to 4 p.m. and 7 p.m. to 9 p.m. Funeral services will be held in the chapel on Tuesday October 23, 2018 at 11 a.m. In lieu of flowers donations to Hospice Georgian Triangle would be appreciated by the family. 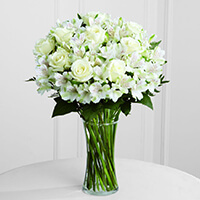 To send flowers to the family of Sherry Anne Elliston (Janes), please visit our Heartfelt Sympathies Store. We encourage you to share any memorable photos or stories about Sherry. All tributes placed on and purchased through this memorial website will remain on in perpetuity for future generations. In memory of dear Sherry and recognition of the great care she was given. So sorry to hear of your loss Gord. Thoughts and prayers are with you. So sorry to hear of your loss, Gord. You have my deepest condolences. May God bless you and keep you. My deepest condolence to you and your family Gord. Very sorry to hear of Sherry's passing. Sending your family love and strength during this difficult time! She surely fought to stay with you all, may she now rest in peace! Our deepest sympathy on your loss. Heartfelt condolences to your family from ours.